UPDATED 11/23/16: If it’s Thanksgiving, then it’s football. This first ran a year ago but it’s still relevant — and the book I’m talking about, Full Color Electric Football, is still available. I highly recommend it. 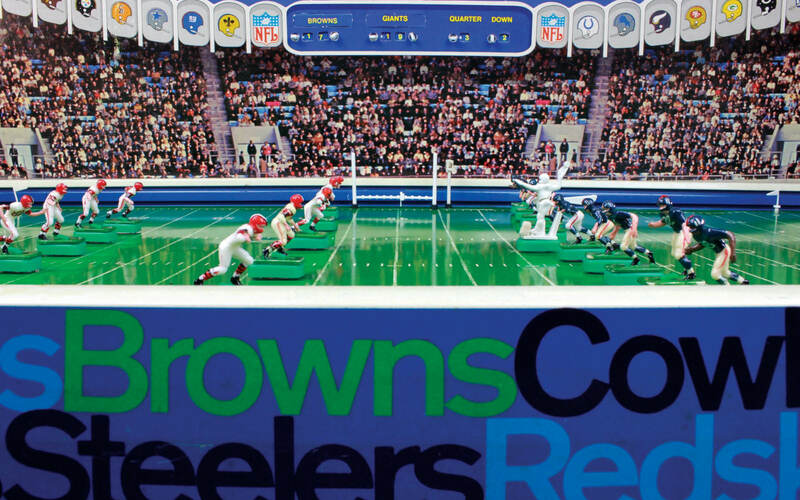 Plus, check out this year’s HOLIDAY HOT PICKS, featuring the 2017 Full Color Electric Football calendar. Click here! Football is the most comic-book of all sports, with its colorful pageantry and stylized violence, its heroes and villains, its last-minute heroics and casual savagery, its lengthy, complicated storylines culminating in a grand, final battle that’s not really final, just final until the next story begins. I was once a devoted football fan, ardent in my childhood love of the Miami Dolphins. I no longer follow the game as I once did, though it’s always on the periphery. On a Sunday afternoon, I might have the Giants, the de facto favorite team of my adult years, on the TV behind me as I bang away at the keyboard, writing about other titans in armored costumes. 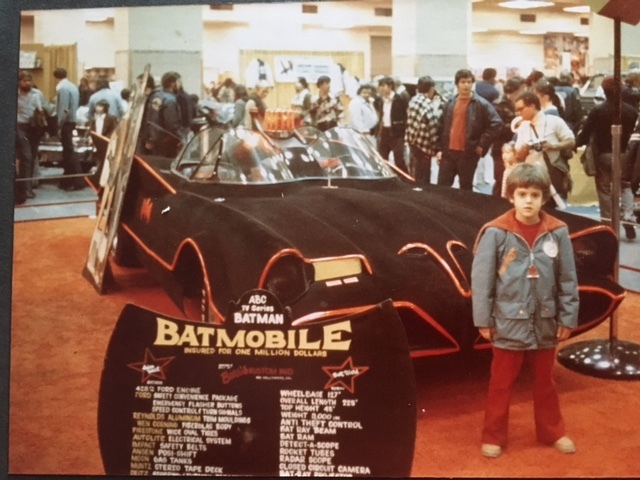 There I am in my Dolphins coat, visiting the Batmobile when I was 7 or 8. I love the voice of John Facenda, the music of NFL Films, the drama of the playoffs. Every year, we host a Super Bowl party. 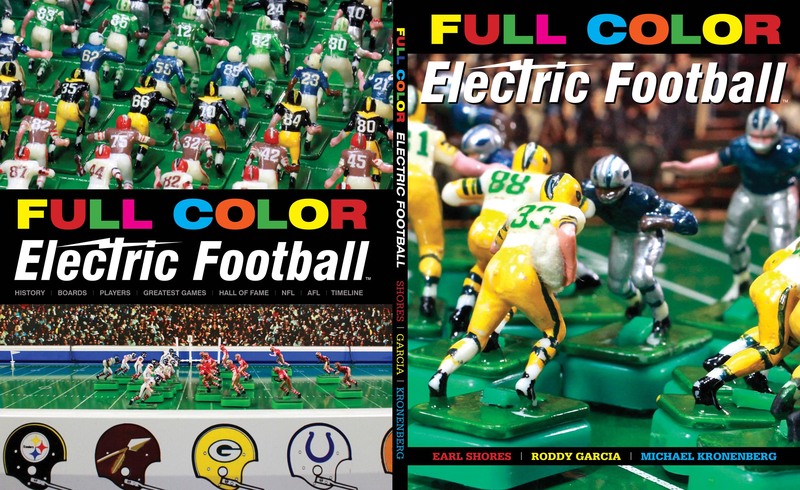 It only goes to figure, then, that as I was breezing through Facebook, I came upon the book, Full Color Electric Football by Earl Shores, Roddy Garcia and Michael Kronenberg, a paperback paean to the metal and plastic tabletop battlegrounds of yore. I had an electric baseball game, not electric football, though I wanted the latter desperately when I was Young Dan. I confess that any time I saw it in action it didn’t seem so much like football as it did loud, vibrating chaos. 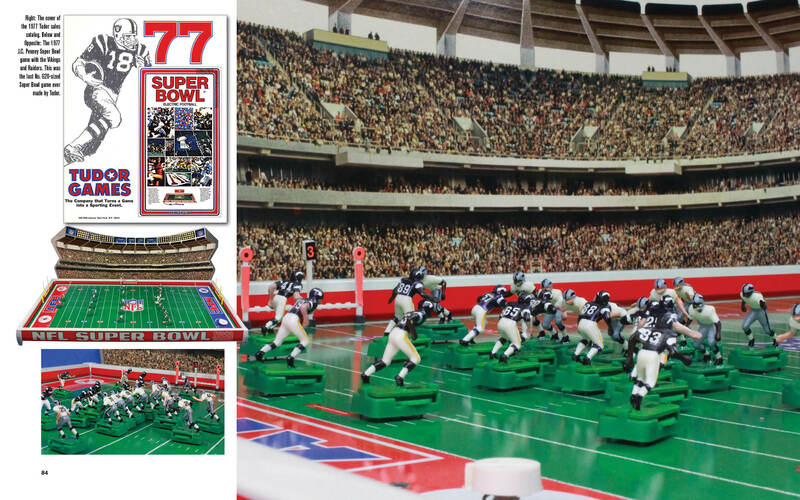 But it looked so cool before you flipped the switch, the mini players looking like gridiron HeroClix — at least that’s how I think of them in retrospect. 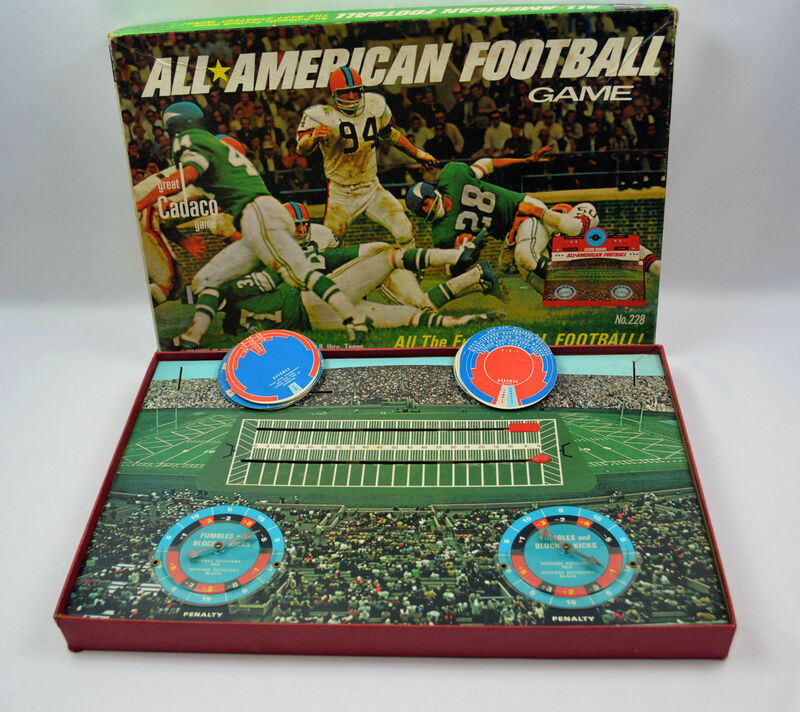 I had a Cadaco football game with spinners, a Coleco handheld electronic football game and an Avalon-Hill board game, Paydirt. … and someone’s selling this too. 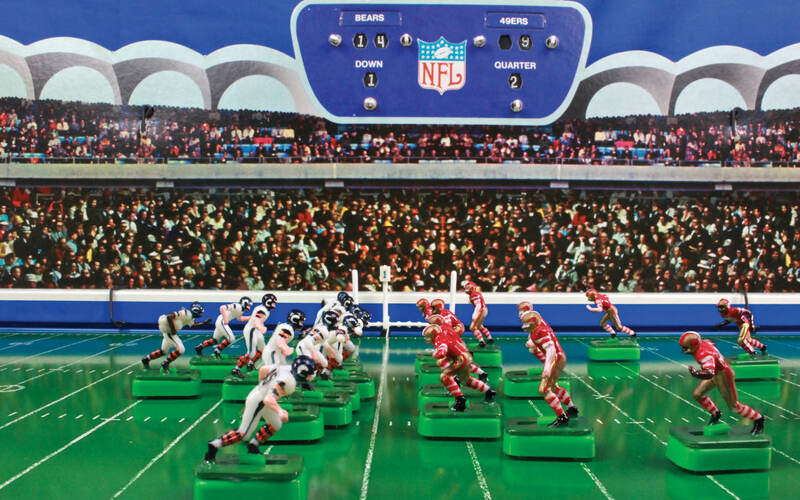 Still, there was always that tiny hole left by not ever owning an electric football game. I have neither the space nor inclination to get one now — but I at least have the next best thing — this wonderfully colorful book of photos that scratches that loud, electrified itch. 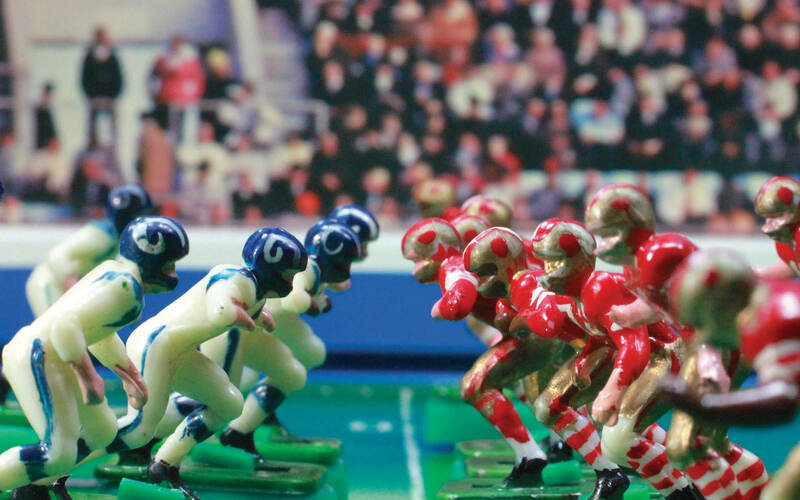 Full Color Electric Football features a broad array of games and manufacturers through the years, with an eye for detail only a true hobby fetishist has. There are fields and grandstands and catalogs and legions of tiny, tiny men, frozen in position, ready to run, pass, catch, block or tackle. I’ve seen Michael around Facebook and we seem to like a lot of the same things. 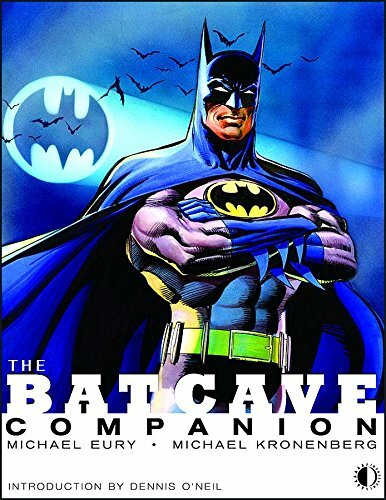 He co-produced one of the best Batman books you’ll ever read — The Batcave Companion, with Back Issue magazine editor Michael Eury, from TwoMorrows. Michael’s a graphic designer and he designs the covers to BI, my favorite comics mag. Dan Greenfield: How did you first get into the game? 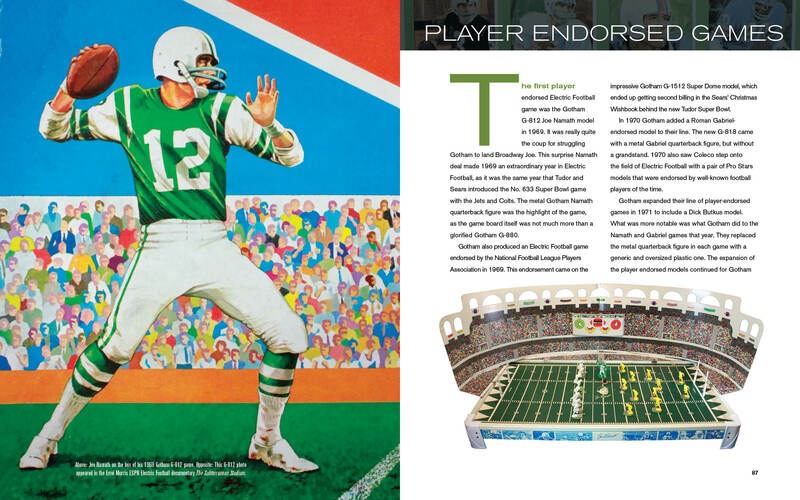 Michael Kronenberg: My first game was the Joe Namath Electric Football Game made by Gotham (shown in our book). I’ve been a New York Jets and Joe Namath fan since I was a kid. 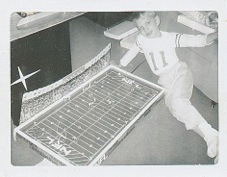 My first Tudor Electric Football game was a Hanukkah gift and replicated the 1972 Monday Night Football matchup between the Jets and Raiders. 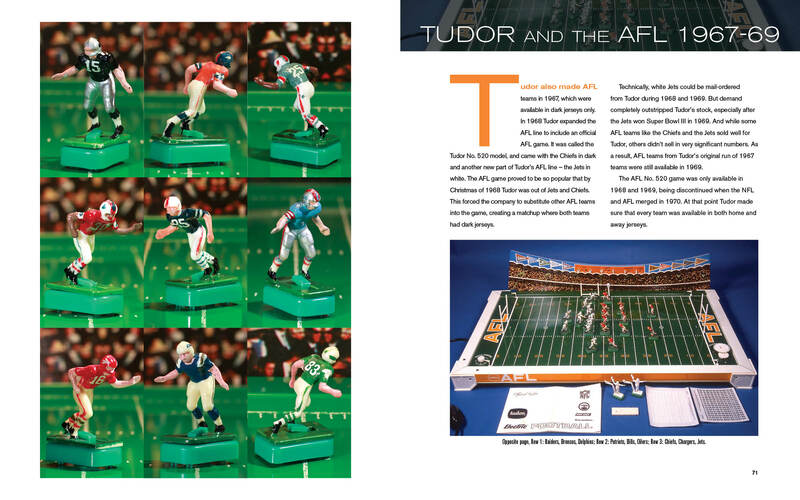 As a kid, I got hooked on the Tudor games because they understood the appeal of the NFL and translated it well to their games. 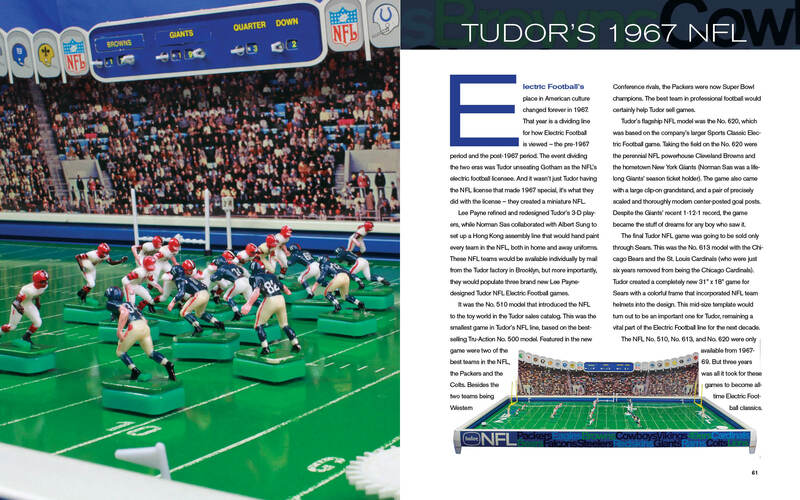 Earl Shores: I received a Tudor NFL game as a Christmas present in 1968. 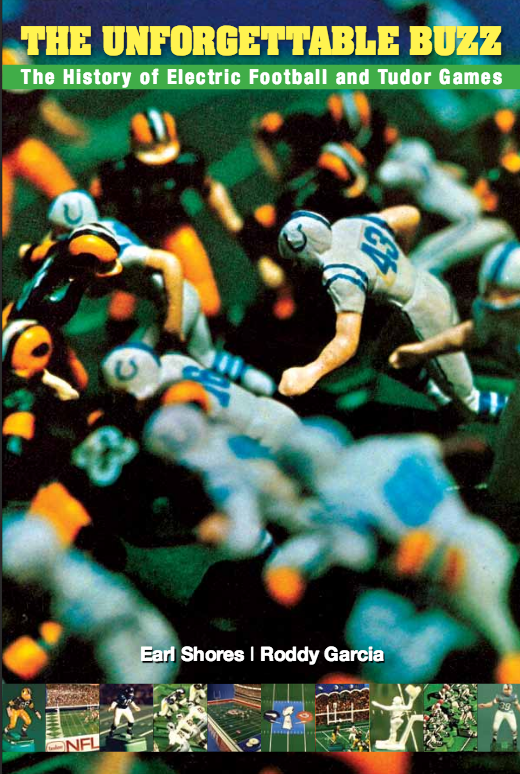 The game in this Christmas photo is actually in Full Color Electric Football (pages 3-4, and page 60). Dan: Did it stay with you since childhood or was it something you rediscovered? 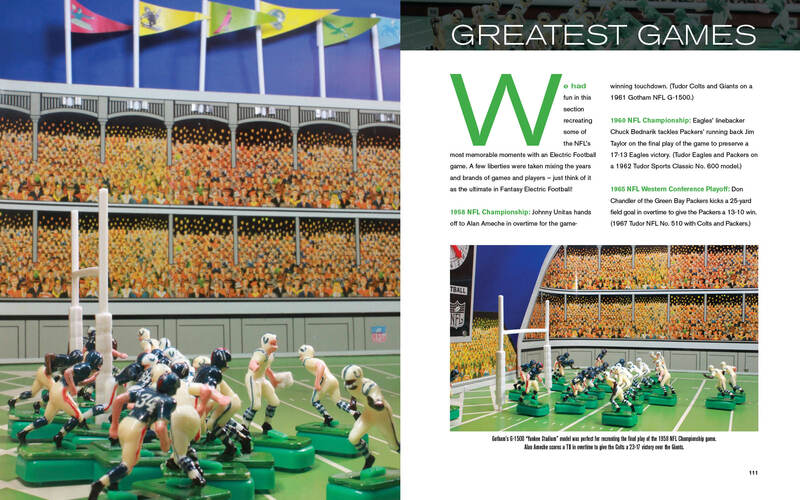 Michael: I rediscovered it when I went to an electric-football convention in Washington, D.C., in 2000. Earl: I rediscovered the game once my writing started career in the early 1990s. I wrote an article called “First and Goal” for Collecting Toys (October 1994), and things took off from there. A number of the games in the book are my originals. Credit to Mom for not throwing them out. Who owns all of these? All told these figures and fields must be worth thousands? Earl: The players and games are a combination Roddy Garcia’s collection, and my own collection. The one-of-a-kind pieces are priceless. I put my original games and teams in that category too. 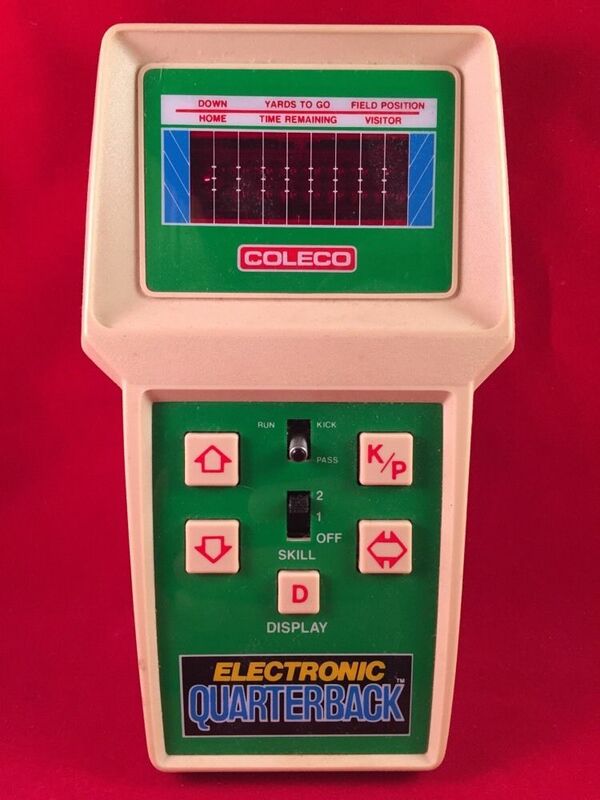 Dan: What’s your best electric-football memory? Michael: My best friend and I started an electric-football league among our friends. We were very serious about it, had all the Tudor NFL teams, kept statistics of our games, had playoffs, and a Super Bowl. Earl: Seeing that first Tudor NFL game on Christmas morning 1968. I didn’t know miniature NFL teams even existed. I was completely taken in. Best present I ever received. For other 2016 HOLIDAY HOT PICKS, click here.